Jamie is founder of LOVE CORN the UK's first Premium Roasted Corn brand. His delicious crunchy corn kernels are packed with flavour and made with love. Vegan, sugar and gluten free LOVE CORN is the perfect savoury snack. LOVE CORN is available across 2,000 stores nationally. Jamie will be joining our panel on "Non-retail routes to market" in the Shoptalk room on Friday. Get your tickets here. 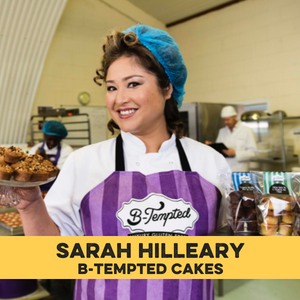 Sarah Hilleary is the Founder & Chief Temptation Officer of B-Tempted Cakes, specialising in luxurious Free-From baked goods. Unsatisfied with the gluten free cake market, Sarah decided to tackle the problem herself, leaving her job in the City and taking her passion for baking to create gluten free creations at home. Since then, she has turned her baking hobby into an award-winning cake company, winning multiple golds in the Great Taste Awards and sold in prestigious stores including Harrods, Selfridges, Whole Foods Market, Harvey Nichols, and Fortnum & Mason. In 2017 Sarah entered the Dragons’ Den in which she walked away with an offer of investment from Dragon Tej Lalvani, to support the company’s inevitable growth. Baking from its fully dedicated Gluten Free and SALSA-accredited site in Leytonstone, East London, B-Tempted Cakes is run by a devoted team of innovative bakers led by Sarah. With its popularity growing, the innovation has not stopped. The company’s new Vegan & Gluten Free muffins and cupcakes are set to be launched in the coming months, positioning the company to be one of the most influential and sought-after brands in the Free-From market. Sarah will be joining our panel on "How to produce yourself- building a factory" in the Shoptalk room on Friday. Get your tickets here. 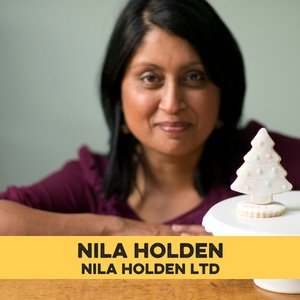 Nila Holden, Nila Holden Ltd.
Over the past 5 years, I have grown my iced biscuit brand, which I started from home, from my kitchen table to being stocked in premium Food Halls such as Harrods, Fortnum & Mason & Selfridges, and also farm shops, deli's and gift stores up and down the country. I've been commissioned by Disney to make biscuits and cakes for their publications, made biscuits for two royal families and I also regularly make biscuits for some of the UK's leading corporate brands such as Benefit Cosmetics, Virgin Atlantic & Thomson Tui. I now also support Food & Drink Entrepreneurs to launch or scale their businesses via the Food Entrepreneur Academy which I set up this year. Nila will be chairing our panel on "How to produce yourself- building a factory" in the Shoptalk room on Friday. Get your tickets here. In 2015 WOW became the first company to gain EU wide FSA approval to make chia seed based drinks. Oliver launched the brand simultaneously in to the UK, Germany and Austria, with France and Scandinavia following less than 12 months later. He has since diversified WOW’s portfolio of products to a total of 4 ranges (with more to come) which are now stocked in over 6,000 stores in six countries across Europe. Whilst the WOW team has worked hard and enjoyed exciting growth, Oliver does not hide the battle scars and openly admits to having already ade every mistake in the book along the way. From drinks blowing up in investors' cars to branding blunders and production mayhem, Oliver ow enjoys sharing his experiences so that others can avoid making similar mistakes and concentrate on adding value and gaining velocity. Oliver will be joining our panel on "How to find a manufacturer" in the Shoptalk room on Thursday. Get your tickets here. After studying at a culinary school he worked as a chef in a gastropub before founding Ice Kitchen in 2012, with the help of his aunt, Nadia. Cesar will be joining our panel on "How to seedfund your business" in the Shoptalk room on Thursday. Get your tickets here. My 'internet' name is msmarmitelover. I'm the pioneer of supper clubs in the UK, starting in January 2009. Since then hundreds of supper clubs have started up in the UK. I've written 4 best selling books, am a social media influencer and award winning blogger and photographer. I'm one of the first new wave of plant based chefs in this country. I gain inspiration from travelling the world. Kerstin will be joining our Press Panel on "How to work with the media" in the Shoptalk room on Thursday. Get your tickets here. Fox founded an advertising agency in the 90’s before exit in 2006. Then founded a brand and strategic consultancy focused on challenger brands. 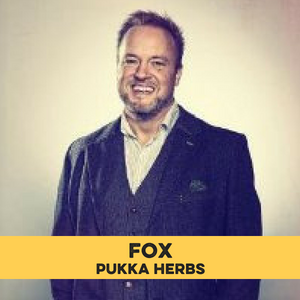 He joined Pukka as Creative Director in late 2012 and since the start of 2015 took global responsibility for marketing across the tea and supplements portfolios as well as all NPD and communications for the brand. Fox has a degree in English and Philosophy, and Postgraduate in Leadership. He has a love of tea, music and cricket – pretty much in that order. Fox will be joining our panel on "Branding and telling your story" in the Shoptalk room on Thursday. Get your tickets here. As Enterprise Editor at The Sunday Times, I cover Britain's most exciting fast-growing private companies in all sectors. Peter will be joining our Press Panel on "How to work with the media" in the Shoptalk room on Thursday. Get your tickets here. Andrew started his career in advertising before a radical life change took him to The Gambia, where he won a UN World Business & Development Award for his work with small-scale producers. In 2012 he co-founded Aduna, an Africa-inspired health food brand, which brings global consumers the vitality of Africa's natural ingredients, while creating sustainable incomes for rural households. In 2015 Aduna was shortlisted for three Guardian Sustainable Business Awards, was a finalist in Virgin’s Pitch to the Rich competition and won the UKBAA Social Impact Investment of the Year Award and two Great Taste Golds. Andrew believes passionately in the power of business to make a positive impact in the world. He holds an MBA (distinction) from Saïd Business School, University of Oxford. Andrew will be joining our panel on "Crowdfunding" in the Shoptalk room on Friday. Get your tickets here.